If you wish to journey somewhere off-the-beaten-path in Scandinavia, the Arctic is a great option! The Arctic Circle starts at 66 degrees north, and this invisible “line” of latitude cuts through the northern part of Norway (including Svalbard), Sweden, Finland, and Greenland. What can I do above the Arctic Circle? Journeys above the Arctic Circle often include active experiences, nature and culture activities such as Northern Lights hunts, dog sledding, glacier hikes, forest treks, and accommodations made of ice and snow. It is also possible to learn about the indigenous Sàmi people, their history and culture including reindeer herding, arts & crafts, and music. Where can I go above the Arctic Circle? There are a variety of options for travelers wishing to venture up above the Arctic Circle. Lapland is where the northern areas of Norway, Sweden, and Finland come together above the Arctic Circle. The indigenous Sámi people call this area home and have spread out over the entire region. There are many opportunities for cultural experiences to learn more about their unique culture and customs. Travelers visit Lapland for a number of reasons not least of which is the skies. You can witness the Midnight Sun (24-hours of daylight) in the summer, and in the winter there is a good chance of spotting the Aurora Borealis (Northern Lights) dancing in the sky. 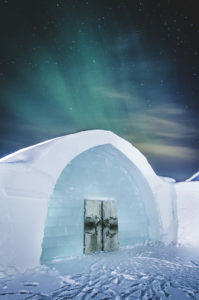 While there stay in a variety of unique accommodations, such as the famous ICEHOTEL, a glass igloo, snow hotel, tree hotel. 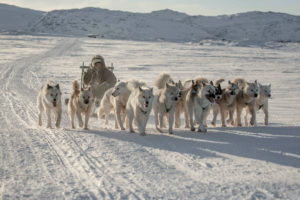 Plus enjoy a variety of activities for each season, from Sámi crafts, hiking, swimming, reindeer sleigh rides, snowmobiling, dog sledding, and snowshoeing. This amazing archipelago is a part of Norway, located in the Arctic, near the North Pole region. The main town is Longyearbyen, on the island of Spitsbergen. From here, it is possible to do all sorts of day excursions, such as dog sledding, exploring an ice cave, fossil hunting, taking an icefjord boat safari, kayaking, and beer tasting at the world’s northern-most brewery! In the summertime, one of the best ways to experience the area is by taking a cruise around the islands – this is also the best opportunity to spot the elusive polar bears that are said to outnumber the citizens. In the winter, the polar nights make this area ideal for Northern Lights hunting. For being such a large country, Greenland is definitely off-the-beaten-path and one of Scandinavia’s secret gems. Much of the country’s interior is covered by snow, glaciers, and an expansive ice cap making it difficult to traverse by land. It is thought that the early Scandinavian settlers called this large island “Greenland” in order to attract more people to settle there. Greenland’s cities and towns are dotted along the coasts, with travel between them accomplished by boat or by air. 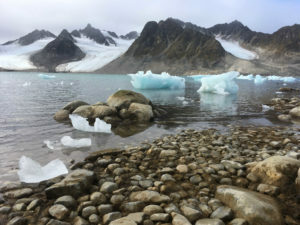 Most of Greenland’s northern half consists of a protected national park, and people need special permission to enter. A cruise is an excellent way to explore Greenland’s coast, but there are only a few cruise companies that offer itineraries to this beautiful, remote country, so booking early is essential. During the summer, one can sail on certain days of the week between Ilulissat in the west and Narsaq in the south (or vice versa). The ship will make stops along the way in the small towns where you will see their colorful houses and buildings. Or, cruise through an iceberg field just outside of Disko Bay. Be sure to have your camera ready for that! Most visitors reach Greenland by flying from Copenahagen, Denmark or Reykjavik, Iceland. In the summer months, day trips can be made from Iceland to the town of Kulusuk. Although if your goal is to truly experience the native Inuit culture we recommend a longer stay as well as a helicopter ride to nearby Tasiilaq. There are opportunities to discover Viking ruins in southern Greenland, or visit the capital of Nuuk in the west. If you are looking for a more active experience, hike an ice fjord or take a day trip to see a calving glacier. If the Arctic has been on your bucket list, we are excited to help you get there! Contact our Scandinavia Specialists today!